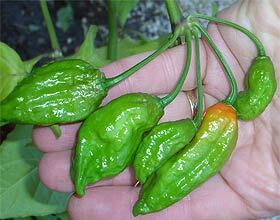 Like the Habanero, Scotch Bonnet and Red Savina™, Naga Jolokia belongs to the Capsicum chinense family. This landrace chile originated in the Northeast of India, particularly Assam, Nagaland, Manipur and neighboring Bangladesh. Other names for this chile include Nagahari, Bhut Jolokia, Bih Jolokia, Borbih, Raja Mircha, Raja Chilli, Mirch, Mircha, Naga Moresh, Naga Morich, Tezpur, and quite recently Dorset Naga. (with possible slight differences). 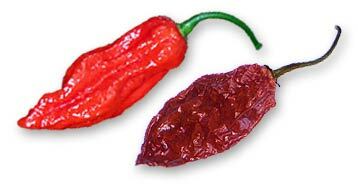 In their home country, Bhut Jolokia and Bih Jolokia are also spelled Bhwt Jolokiya and Bih Jolokiya respectively. For many years, there was uncertainty about this particular chile pepper, some sources even listed cayenne-type peppers as Naga Jolokia or put it into the C. frutescens species. Eventually a field trial with comprehensive analysis by the NMSU Chile Pepper Institute (CPI) shed light on this cultivar. 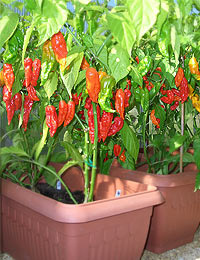 Both Assamese growers and the Chile Pepper Institute found top heat levels around one million Scoville Heat Units (SHU), and the Chile Pepper Institute’s findings for Bhut Jolokia were even awarded the world record as the “hottest of all spices” by Guinness World Records (September 2006). The stem is green, with anthocyanin (dark color pigments) present at the nodes. The leaf surface has the characteristic crinkle look as in other C. chinense varieties, leaf size is 10 to 14 cm (length) and 5.5 to 7.5 cm (width). Bhut Jolokia, five pods per node. Also as typical for C. chinense, flowers are pendant, with creamy white corollas, often with a touch of light green. The filaments are purple, the anthers blue. As also typical for the chinense species, there’s more than one flower per node. While the Assamese growers (Bih Jolokia) as well as the Chile Pepper Institute (Bhut Jolokia) report two flowers per node for their respective plants, we found clusters of up to five on the Naga Morich test plants we grew in our Pepperworld greenhouse from original “Chileman” seeds, as well as on Bhut Jolokia plants (grown from CPI seed). Depending upon the source, certain calyx differences are evident, and also in fruit shape. 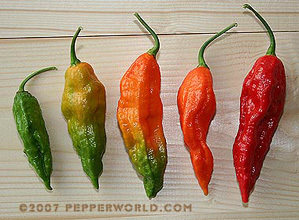 Growing the various peppers next season will hopefully bring more insight, so some updates in the future are possible. The elongated fruits are 5 to 8.5 cm in length, 2.5 to 3 cm in diameter (at shoulder), with an undulating surface. We noticed that depending on the source, fruit shape also seems to differ a bit. Fruits mature from green to bright red. The CPI reported that the constriction between calyx and pedicel found in C. chinense was present on the Bhut Jolokia fruit, but the penetrance of this trait was reduced. 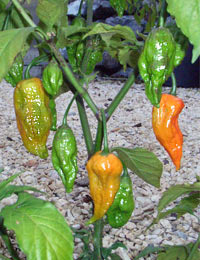 Growing conditions are similar to the Habanero and other C. chinense varieties. Days from transplanting to Maturity: 90 days green, 120 days or more for red ripe pods (caution: the pods can already be very hot while still green). CPI noted that in their trials, Bhut Jolokia never produced fruits without artificial pollination in the greenhouse, and little pollen was produced (which means their flowers might need a little help with a fine brush indoors – insects, especially bees, can be helpful as well). Also, the seed count per pod was low compared to the other C. chinense cultivars (see picture of lengthwise cut below). 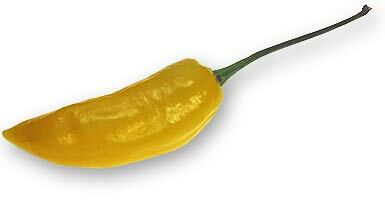 The fruits of this chile variety are extremely hot. It is advised to wear gloves when handling the peppers, keep them away from children, and thoroughly clean all kitchen utensils like cutting boards, knives etc. When grinding dried Jolokias, wear a breathing mask, protect your eyes. Don’t touch any sensitive parts before cleaning your hands thouroghly first. And use these peppers sparingly – it is always easier to kick up the heat of a dish than toning it down. In their home country of Northeastern India, Naga/Bih/Bhut Jolokia chiles are used pickled (expect some very hot vinegar as a byproduct!) and for firing up non-vegetarian dishes like fish curries. You can use them like regular habaneros, just remember they’re up to five times as hot. Naga/Bih/Bhut Jolokia peppers are certainly great for ultra-hot sauces without the use of extract. If you cut Jolokia pods lengthwise, the rather thin-walled pods are easy to dry. In more humid climates, you may have to use a dehydrator. Using a retired coffee grinder, you can turn the dried pods into a wonderfully hot and flavorful powder (store it in a cool, dry and dark place — and don’t inhale the dust from grinding!). The pods also freeze quite well.